Heater: 250 Watts, 2 Pcs. Application : Sealing /Capping of Glas bottle with R.O./ROPP/Tear off/Montgomery/special type caps/seals. Rollers : 2 No. Threading and 2 No. sealing Rollers. 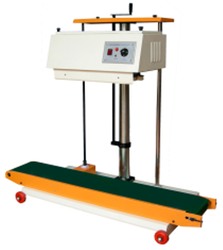 In our extensive range of products, we are presenting our clients a wide assortment of Four Side Sealing Machine. Our products range is specially fabricated for packing free flow liquid like mineral water, milk, buttermilk, soft drinks with very high precision setting of quantity. Clients can avail these products at competitive prices. With rich industry experience, we are engaged in providing our clients an extensive range of Pneumatic Sealer for Steel Strap. This is a compressed-air tensioning tool in conjunction with a compressed-air closing tool that is used for strapping large and heavy load units with a very high level of tension in the steel industry. 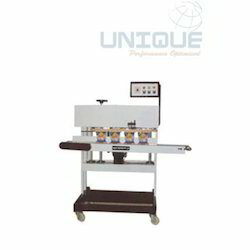 Backed by a diligent team of professionals, we have been able to manufacture, export and supply a qualitative range of ROPP Cap Sealing Machine.